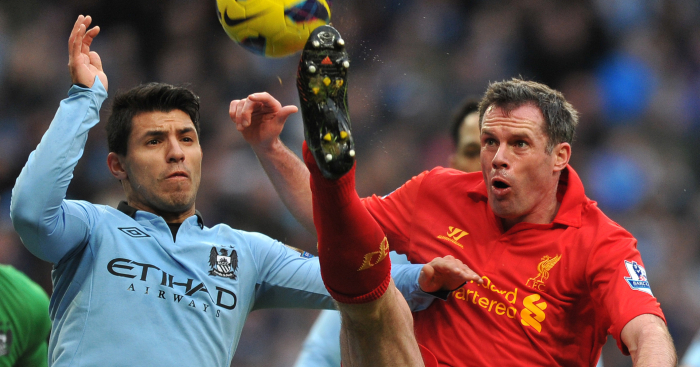 Sergio Aguero is "the greatest" goalscorer in Premier League history, according to Jamie Carragher. Aguero netted his second hat-trick in a week as Manchester City dismantled Chelsea on Sunday. The Premier League leaders and reigning champions hit Chelsea for six at the Etihad Stadium, with Aguero's treble helping him pull level with Mohamed Salah in the race for Golden Boot. 62) in eighth, and three off the pace of Robbie Fowler (163) in seventh. The only non-English player with more Premier League goals is Thierry Henry, whose 175 goals came in 258 games, compared to Aguero's 160 in 229. Carragher feels the forward, who need s 11 more goals to become the highest-scoring 30-year-old in Premier League history is "the greatest goalscorer" England's modern top flight has ever seen. "He's just clever. He's switched on, he's alive, "he told Sky Sports.
" I've played against him and at times he can be quiet in a game, but before you know it something just happens. In terms of a goalscorer, he's the greatest we've seen in the Premier League. "That's the difference between him and the other greats, he's a goalscorer rather than the greatest all-round player.
" He does work a lot harder now than he ever did. The manager has lit the fire under him. "He was always a fabulous player. He did not want to take part in getting the ball back and defend for the team, but now he's pressing collectively. Guardiola got Jesus in and played him for a bit in front of him and he's lit the fire under Aguero. "This is where City is right now with all the players they've got. The manager repeats himself and in the end the players stop listening.
" How could you be in a position where Aguero is possibly thinking he'd not be playing every weekend. If he's thinking like that then everyone else is thinking like that. "